Did Canadian High Schools Fail Justin Bieber? A story came out a few days ago that needs some comment. Not so much because of what happened, but because of the reaction in the media. Facts: While David Letterman did attend high school (Broad Ripple High School in Indianapolis, USA), and describes himself as an average student, Justin Bieber does not go to high school at all due to his star status, show business, and travelling (mostly in the USA but also world wide and a few trips back to Canada). Backup Stories: Two year ago, Justin Bieber got in another another spot of trouble in an interview where Bieber replied "I don't know what that means" in response to the question "Is Bieber German for Basketball, true or false?". At that time there was another media storm of controversy, but not about Canadian High schools because it is a fairly well known fact that Bieber does not go to school, but has a tutor that follows him around on his travels. Actually, if you saw the mobs that form wherever Bieber goes you would realize there is no chance for him to actually learn anything in a normal school setting. Anyway, apparently it was another false media thrash, in that Bieber actually did know what "German" meant, and could prove it with previous video interviews and clips. Not surprising, since Bieber's home town is near the most German part of Canada. But an exceptionally stupid question has the potential to stump the interviewee, thus making a bigger story than the sensible questions. That's why there are so many stupid questions in media interviews. Speculation: Now I'm going to do some speculation of my own, since the media seems to not have that ability. What could have caused Bieber to say Sixteenth Chapel? - Loss of hearing. Dave Letterman clearly said Sistine Chapel first, Justin was repeating what he said. Maybe Bieber is going deaf. - Making a Joke. Bieber trying to be funny. - Maybe Justin really does not know the name of the Sistine Chapel, but maybe it was because he was not listening, or asleep, when the subject was taught. Not because the tutor or teacher taught "Sixteenth Chapel" by mistake. - Maybe Justin's concentration was put off by the little wrestling match that had just finished between him and David Letterman. The wrestling match was started by Dave, probably surprised Justin. Makes me wonder more about David Letterman losing his marbles than it does about Justin's home schooling effort. Now for my response to Dave. I am not really trying to defend Justin Bieber, my interest is in defending education in general, and Canadian high schools in particular. I don't know about all high schools, but I'm guessing that art history in not "core curriculum" in most North American high schools. When I was a high school history teacher, I'm sure I could not tell you how many of my students knew the name of the Sistine Chapel. And I could not tell you where I learned the name myself, but I have heard of it. But one of my blogs has a photoshop of God on a motorcycle, and I used the face of God from a picture of the Sistine Chapel that I found online. So I must have know about it by then. And, this question is directed at you Dave: Where did you first learn about the Sistine Chapel? Did you really learn about it in high school? Maybe they should have been concentrating on math, science and maybe media studies instead. Is the entertainment business partly to blame for poor quality education, by taking youngsters out of school and making them role models and downplaying the need for education? A good education is about the ability to think for yourself and ask questions. It should not be all about memorizing names. Dave was simply doing his job. Asking stupid questions to try and get a reaction, (and when that does not work - physical assault). And yes, it is a stupid question to ask Justin Bieber if he is going to get a tattoo of the Sistine Chapel. Instead, do some research, find out he is home schooled, and ask him if he is getting a good quality education outside the school system. 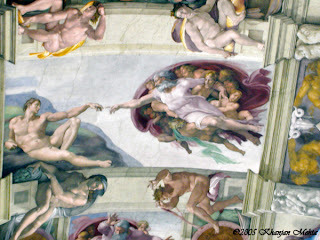 Picture: Part of the Sistine Chapel art work. I think it's on the ceiling, but I'm not sure as I've never been there, and I was not taught about it in school.